Life on a remote island in the South Pacific brims with quirky surprises. We learn to expect most anything. While driving to town, the random pig will dash in front of the car, causing us to slam on brakes. Sometimes, it’s a dozen pigs, or a pair of dogs, or a clutch of chickens; or a child, who seems to delight in the cheap thrill of racing across the road and living to laugh about it. I live in Nuku‘alofa on the island of Tongatapu in the Kingdom of Tonga, which is 1,240 miles (1,997 kilometers) northeast of Auckland, New Zealand. 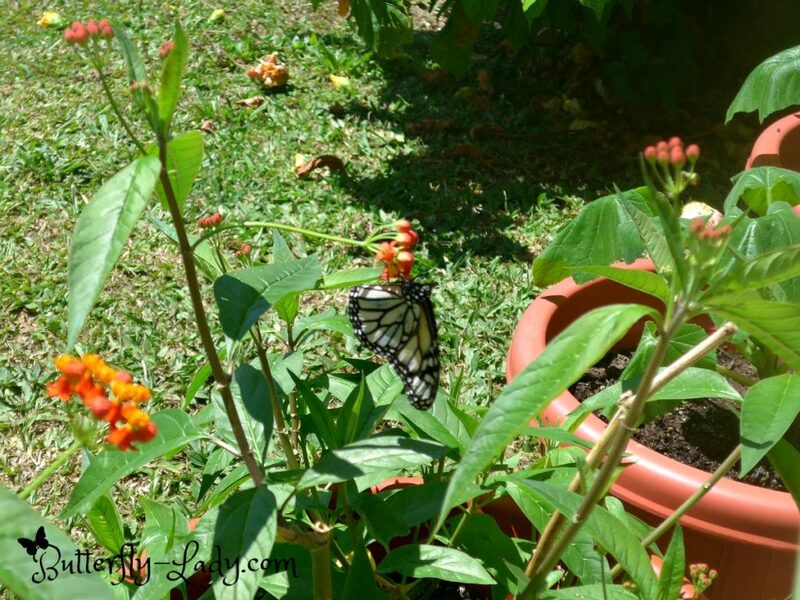 A few days ago, a white Monarch butterfly (Danaus plexippus nivosus) found the Tropical Milkweed (Asclepias curassavica) in my yard and began laying eggs. A female white-form Monarch butterfly nectaring in Tonga on flowers of Tropical Milkweed, which also happens to be her host plant for egg laying. I thought her wings were just old, worn, and faded, as butterflies can get as they age. But, on closer inspection, I realized that she was actually white in the places where she should have been orange. We have Monarch butterflies here in Tonga (read more here), but this is the first white Monarch that I’ve observed anywhere. A female white Monarch butterfly in Tonga. She was skittish, not wanting me to photograph her up close outside. I caught her with a soft butterfly net and placed her in a pop-up cage inside. Eventually, she relaxed and I was able to shoot this pose. According to Monarch Watch, white Monarchs have been found throughout the world, including in Australia, New Zealand, Indonesia, the Hawai‘ian islands and on the mainland of the United States. Generally, white Monarchs are extremely rare with only a few being reported each year. 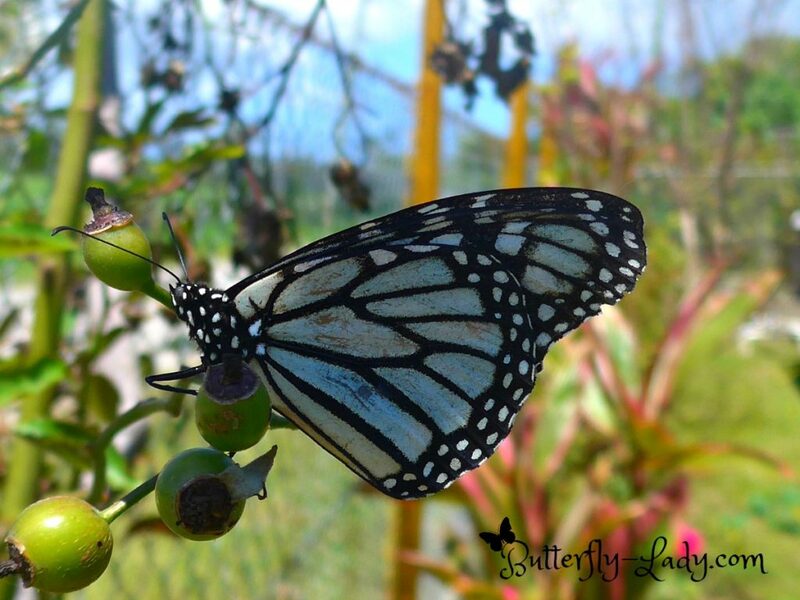 The exception is in Hawai‘i where it is believed that as much as 10% of the population of Monarchs is white. 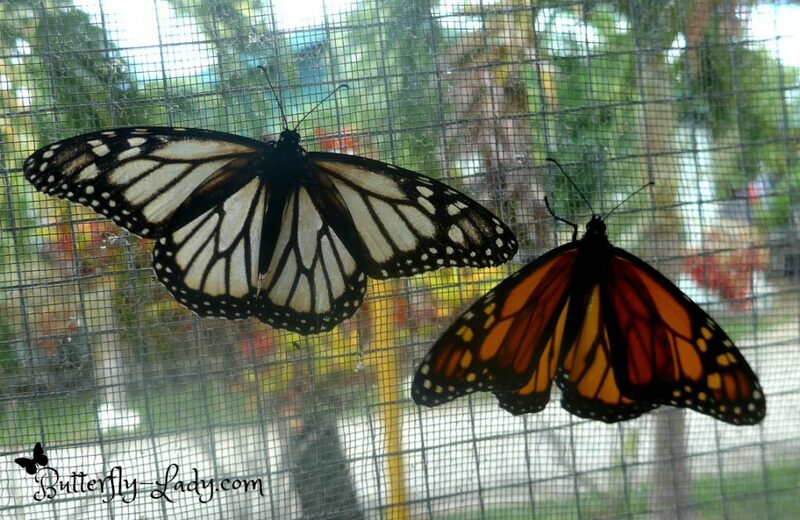 White and orange Monarch butterflies side-by-side for comparison. Monarchs are preyed upon by birds called Red-Vented Bulbuls (Pycnonotus cafer), which are quite abundant here on our island, as well as in Hawai‘i. Red-vented Bulbuls come from Southeast Asia and are relative newcomers to the islands of Polynesia. Scientists suggest that predation is lower for white Monarchs and raise the possibility that the white form is more cryptic (harder to see) for the Bulbuls than the orange form. Consequently, they eat more regular, orange-form Monarchs than white-form specimens, increasing the relative frequency of the latter in places where both white-form Monarchs and Bulbuls range. As I attempted to get a photo of the white Monarch, a huge Wasp (Hymenoptera apocrita spp.) was flying around which made me nervous, and an aggressive male Blue Moon butterfly (Hypolimnas bolina) kept chasing her away as he displayed his natural territorial tendencies. I realized it was going to be impossible to get a good photograph. 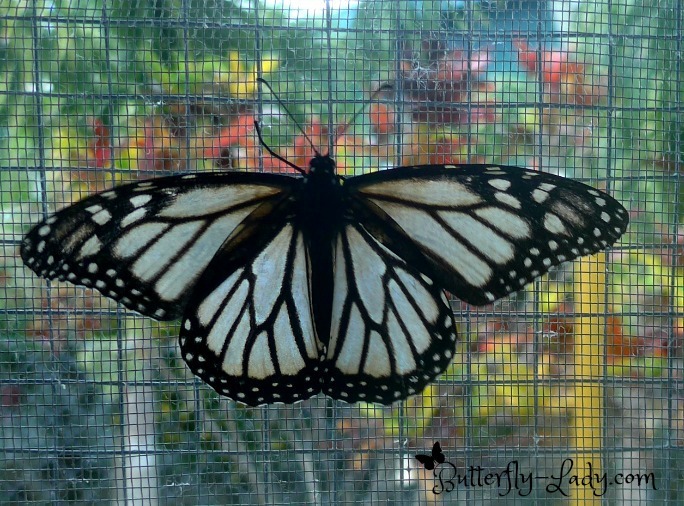 So I caught her with my butterfly net and placed her inside a pop-up cage with some Milkweed (Asclepias spp.). Final view of the white Monarch as she enjoyed her freedom in the garden. After an overnight stay for observation, I released the white Monarch the next morning. She left me many eggs on the Milkweed in the cage, even laying on the screen, so I thanked her and set her free. To my surprise and delight, she lingered all day in the garden and continued to come back, time and again, to nectar on the flowers and deposit eggs on the outside Milkweed. I sat on the porch and enjoyed watching her glide gracefully through the air as she flew back and forth in my yard. Some cultures believe that a white butterfly brings good fortune. I don’t know about any fortune. However, the visit of this beautiful white Monarch brought me great joy and surprise. For that, I’m rich.